We use insight to efficiently and effectively develop strategies for profitable growth across a range of consumer-driven business challenges. And information alone is not insight. Generating insight that can genuinely change a business takes hard work, experience and inspiration. Every business is unique and needs to be fully understood in context in order to develop real solutions to any commercial challenge. While every project is different, that shouldn’t mean starting afresh each time; work should build from lessons learned, and insight already gathered. We build solutions to drive profitable growth across a range of consumer-driven business challenges. Business challenges do not exist in a vacuum; the competition, the context and even the question itself will be constantly evolving. Traditional ways of working don't reflect this: they are too slow, too divorced from business reality and too focused on outputs rather than outcomes. 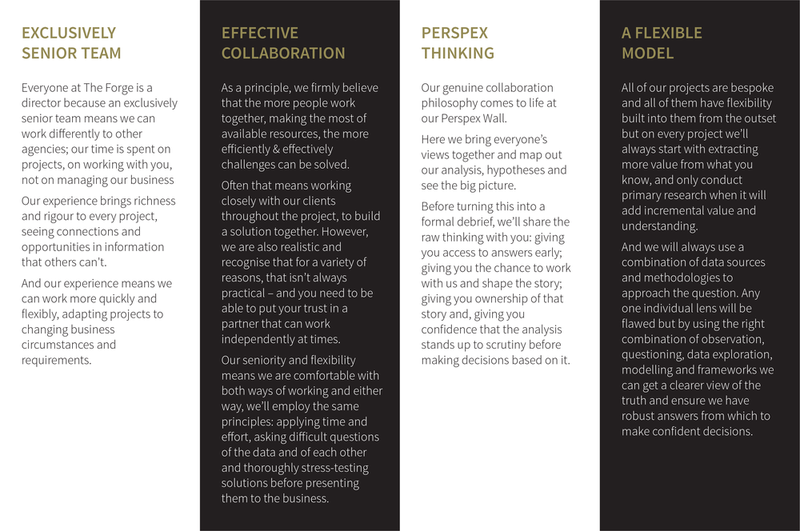 Our structure and the way we work is designed to ensure that we can deliver genuine commercial impact into a business quickly and efficiently. Our approach has led to incredibly successful projects and partnerships with everyone from start-ups to global icons.